With great franchising comes great responsibility. The sixth Spider-Man movie in 15 years finally finds your friendly neighborhood wallcrawler back home where he belongs, fighting crime alongside Iron Man and namechecking Thor, Hulk and Captain America as part of the full Marvel universe. Well, not right alongside them, actually. 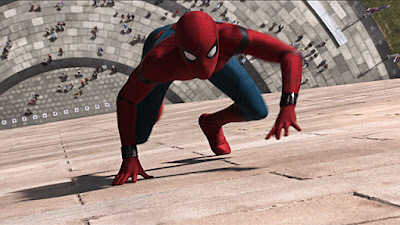 Whereas we were first introduced to this new Spidey (now played by Tom Holland, completely winning and making the role his own) during the great airport fight in Captain America: Civil War, Homecoming brings him back to Queens, where he scoops up purse snatchers and helps old ladies with directions while longing to live in the Avengers tower visible across the East River. This is the Spider-Man I grew up loving: the one who's on the ground, not so much saving the world as helping the little guy. Homecoming is one of the smallest-stakes Marvel movies to date, and that's one of the things I love about it. Truth be told, there's quite a lot about it that I love. See, Spider-Man is my favorite superhero from as far back as I can remember. I grew up reading every Spidey book I could find, desperately trying to watch his live-action exploits, whether it was in the Nicholas Hammond TV movies or as short sketches during The Electric Company. When the original Spider-Man was coming out back in 2002, I put myself through the uncanny valley nightmare that is Final Fantasy: The Spirits Within just to catch a short teaser. My wife was counting down the months until the film was released with little Spider-Man-themed gifts, culminating in an engraved Spidey watch I still have to this day. We left work early to see the movie, then went back and saw it again that night. Spider-Man has always been a big deal for me. Homecoming rewards my devotion to the character. I'm not sure I can ask for more than that. Picking up with a really fun first-person montage of Peter Parker's adventures in Civil War, Homecoming finds him back in Queens and waiting for the next call from Tony Stark, thinking something bigger and better awaits him. 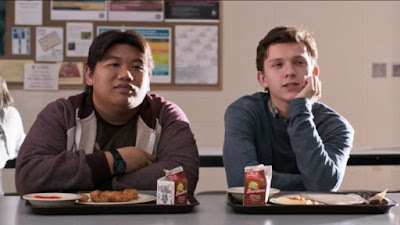 In the meantime, he lives with his hot Aunt May (Marisa Tomei), attends high school and crushes on a senior girl (Laura Harrier) while only his best friend Ned (Jacob Batalon) knows his real identity. When Adrian Toomes (Michael Keaton), a criminal using weapons upgraded with alien technology, begins committing robberies and arming the rest of the city with dangerous tech, Peter is determined to put a stop to this Vulture and show the Avengers that he's ready for the big leagues. Yes, this is the Spider-Man movie that skips over his origin story, thank goodness. There's a line of dialogue that acknowledges "everything Aunt May has been though" and another brief conversation about what it feels like to be bit by a radioactive spider ("The spider's dead, Ned," Peter explains), but that's it. 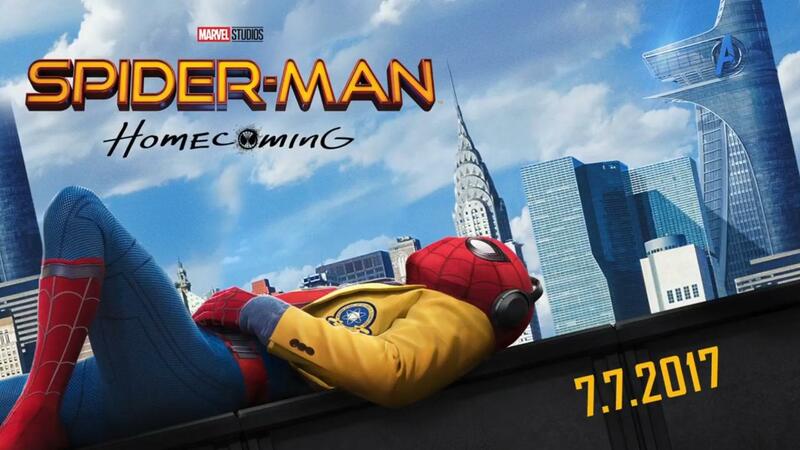 Otherwise, Homecoming drops us right into the day-to-day of being both Spider-Man and Peter Parker: doing homework, competing on the school's academic decathlon team, getting a date to the dance. If I have to take any issue with Homecoming's screenplay (credited to no less than six writers, usually the kiss of death on a movie this big), it's that in bypassing Peter Parker's life before being Spider-Man, it misses out on getting to know him better as a regular teenager. For as much as director Jon Watts is using the John Hughes teen comedies of the '80s as his template, I found myself wishing for a bit more teen movie. A lot of screen time is devoted to Peter being all "I gotta follow that guy" or "I'm gonna go get that guy!" and it sometimes sells the larger story short. By the end when the Vulture's motives are revealed, however, Peter's two lives dovetail beautifully in the span of a single car ride. It's a great scene. I'll admit to being somewhat skeptical when Watts was announced as the director of Homecoming, if only because this character is so important to me and I didn't want to see Marvel blow their first big opportunity to get a crack at the wall-crawler. I like Cop Car and I like Clown enough, but neither tell me much about who Watts is as a filmmaker or what qualifies him to make a Spider-Man movie. But, as has been the case a few times with Marvel, I shouldn't have been so worried. Their output isn't perfect and I can understand many of the criticisms that have been leveled against their movies over the years, but Kevin Feige has a real knack for identifying talent and matching it with material. I love what Watts does with Spider-Man: Homecoming, which is bright and poppy and endlessly fun, closer to Ant-Man or the Guardians of the Galaxy movies in tone than anything else Marvel has done. There is a willingness to go for comedy while never pushing too hard for the jokes; the humor comes from the characters and the situations, not from everyone stopping to crack one-liners and speaking in the same voice. The little details are delightful, like the way everyone reacts to Aunt May or how Peter's friend Michelle (teen star Zendaya) is basically playing Ally Sheedy from The Breakfast Club down to her reasoning for sitting in detention. The supporting cast is amazing, too, with one actor after another that we're happy to see show up: Donald Glover, Martin Starr, Logan Marshall Green, Bokeem Woodbine, Michael Chernus, Tony Revolori. It's a comedy cast, but no one is used explicitly as the comic relief because everyone gets to be funny. They're just not only funny. Much of this movie's raison d'être is to bring Spidey into the larger Marvel cinematic universe, but as excited as I am to see that happen (as a fan of the MCU and an even bigger fan of Spider-Man), I'll admit that I had my concerns that this would be another Iron Man 2 situation, where the story being told keeps getting interrupted so Jon Favreau or Robert Downey Jr. could show up to remind us that, hey, this a Marvel movie. And there absolutely is some of that. Most of the MCU fabric is woven into the film in a really fun way, though, whether it's Captain America's PE class cameos or a history teacher talking about the Sekovia Accords or an Ultron head being discovered and tossed away or even the first appearance of Damage Control, the fictional superhero cleanup crew that was introduced in a late-'80s limited series (which I bought as soon as it came out but didn't necessarily love). This is a movie that exists inside the Marvel Universe without having to kill itself trying to establish the Marvel Universe, which is a nice place to finally be. It's there on the fringes, just like Spidey himself. Like so many modern superhero movies, things become less interesting in the climactic battle when a bunch of pixels and CG take over for a lot of loud, busy fighting that means very little and is almost never staged in an interesting way (something I still have to give Doctor Strange credit for sidestepping). 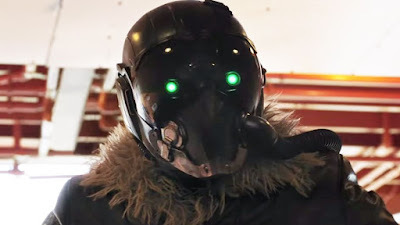 I love how Spidey and the Vulture work as mirrors of one another and I love Keaton's performance, but the big fight at the end is where Watts really lets the movie get away from him. There's an action set piece on the Washington Monument that's cool and another on the Staten Island ferry that's cool, so I know Watts can handle action in a way that's at least serviceable. The final fight, though, just doesn't work. This is a phenomenon that dates back further than even the first Iron Man almost 10 years ago; even the Sam Raimi Spider-Man movies dealt with a similar issue. The good news is that Spider-Man: Homecoming quickly recovers with a series of delightful surprises, an amazing punchline and probably my favorite post-credits scene ever. Watts and company have their eye on the ball until the very last frame. So yes, I loved Spider-Man: Homecoming. It's lacking a bit of an emotional component present in some past Spider-Man movies, but makes up for it with sheer fun and entertainment value -- this is a movie that had me smiling the whole way through. It's a corner of the Marvel universe in which I'm happy to live, surrounded by characters I love and real-world conflicts (well, real-world enough) that don't involve a blue light shooting into the sky. It also presents one aspect of the web slinger to which I've always been drawn, which is that it's hard to be Spider-Man. This Spidey gets banged up, he makes mistakes, he falls down, he cries. About two-thirds of the way through the movie, there is a visual tribute to one of the most iconic Spider-Man images so specific and beautifully constructed that I knew just how important it is that Spidey is now home and that everyone involved with Homecoming genuinely knows and loves Spider-Man. I love Spider-Man, too. Welcome home, Spidey. Come back soon. While almost every other villain in the MCU either dies by their own hand or is killed by one of the heroes, Spidey actually gets to prevent that from happening here. It's such a rare thing in modern comic book movies and I think it made for a great moment. Thanks for farting in our face post credits Capt'n. I get why the movie worked so well for so many people. I liked it a lot, too. It just didn't gel for me. I thought the exact same thing about the Ramones soundtrack. How difficult is it to listen to an entire album? One of their albums clocks in at 29 minutes. I was steeling myself for an "It's fine" but I'm so glad you liked it as much as I did! I think that the movie did a fantastic job of selling the sacrifices that Peter Parker has to make to be Spider-Man - every time he had to miss out on something that every teenager should experience I was devastated. I was also really impressed with how long a certain series of scenes (which includes the car ride) played out. I loved that they didn't worry too much about showing us epic scenes of Spider-Man swinging on skyscrapers, because we've seen it before. Focusing on scenes like him running across a golf course was so in keeping with his character at this point in time. I agree that the ending fight isn't great, which I think stops it from eclipsing Spider-Man 2 for me, but I also agree that the movie almost immediately recovers. I'm going to rewatch Spider-Man 2 this week and head back to the theatres for Homecoming round two! I loved the movie and like you said how it's very to the ground. This Spider-Man deals with issues below Avengers level but above the Defenders. My biggest gripe was that it kind of threw off the rest of the MCU timeline. I love this version of Spider-Man. By far my favorite in the series (I think Spider-Man 2 is way over rated.) And like you, Spider-Man was my favorite comic book as a kid. Best part of all no whinny toby McGuire face. According to the filmmakers, MJ isn't Mary Jane Watson. Instead, it's supposed to be coincidence. This double fake out makes the reveal even more pointless and annoying. Was happy to see Zendaya's in this. Great review, and mirrors a lot of my thoughts of the film. I loved the movie, and I think the biggest reason is Tom Holland. He captures the feel of both Peter Parker and Spider-Man in a way that I didn't realize was missing in the previous films (which isn't a slam against them, they just leaned more into the tragic side of the character). Endearing is the best word I can think of for his performance. I also love the genre mash-up aspect of the film. Sure, the high school stuff could be a bit less overt pastiche, and the superhero stuff could be a bit less by the numbers, but combining them as skillfully as I think Watts does elevates the movie as a whole. Peter's a teenager, both literally, and as a superhero. He's nearly an adult, but he's still treated like a kid, and he's still figuring things out. His challenges aren't objectively earth-shattering, but at his age, to him, they feel like they are. The movie this most feels like, in terms of nailing the version of the character that's in my head, is Batman Begins. And, like that movie, there's some stuff that doesn't quite work (Rachel, the final battle). But, ultimately, it sets up a version of the character and his world that I can't wait to return to. Great review, Patrick - just got back from it and I had a blast. I'm so glad Spider-Man gets to play in the Marvel sandbox and this is the right take on Spider-Man for that. I love Raimi's movies but I don't see his Spider-Man as being part of a larger world of superheroes and, though I don't even really want to compare them, it's a good example of how different interpretations of a character can suit different story purposes while remaining true to the spirit of the character (unlike, say, Donner's vs. Snyder's Superman). Tom Holland is great - I wasn't totally in love with his casting when I watched Civil War, but now that I've seen this Peter Parker and his world fleshed out, I think he's perfect - long live the new Spider-Man! I'm late to the party here but just saw the film and finally had a chance to read your review. You nailed my feelings about it; I'm a big Spidey fan too (he's my favorite Marvel superhero) and I think this film perfectly captured the spirit of the character. I was a fan of Holland in Civil War, and loved his performance here. He really takes the role and makes it his own. While it's not a performance thing per se, I love his voice and like that they called attention to it here. He sounds like a kid, sounds like I sounded when I was 15. I think the film works best in the small moments. Peter looking down at his friends at the pool, literally missing out on important aspects of his childhood so that he can be a superhero. His rather boring day as a superhero, where his biggest accomplishment is helping an old lady cross the street... In Raimi's films Peter was stopping big crimes left and right, while this Peter's exploits day-to-day felt more realistic and down to earth. I could have done without much of the Tony/Happy stuff, especially the bit at the end with the press conference. I think if you trim all that down and focus more on Peter's life, you'd have a tigther, better film that doesn't feel quite as long. Not Iron Man 2 level distracting, but a bit problematic nonetheless. I absolutely loved Michael Keaton in this, and while I had my doubts about the Vulture design, I thought they did a great job with it. He's easily one of the MCU's best villains, mostly because he's just a white collar dude trying to do what he thinks is best for his family in a justified situation. That car ride sequence is next-level great, and is another example of the film working best when it slows down. Overall, I really enjoyed the film, and am happy to see a Spidey that exists in the MCU, distracting side plots aside. I'm excited to see this Peter grow as a hero (talk about a great origin story that doesn't feel too formulaic) and hopefully he gets a bunch more films before they inevitably re-re-reboot it. I am glad that I finally got a chance to check out this event space NYC. Great views, food is nice. The quality of service was great, and the environment were pretty comfortable. I’ll say I will look forward to visit again. Spider man is one of the top Brand movie which is known and seen by the whole world there is no one who have not seen this movie and I am also biggest fan of this movie.